Force 10 ranges provide completely safe cooking at sea, with a minimum of maintenance. Standard infrared broilers produce great sandwiches and broiled fish. 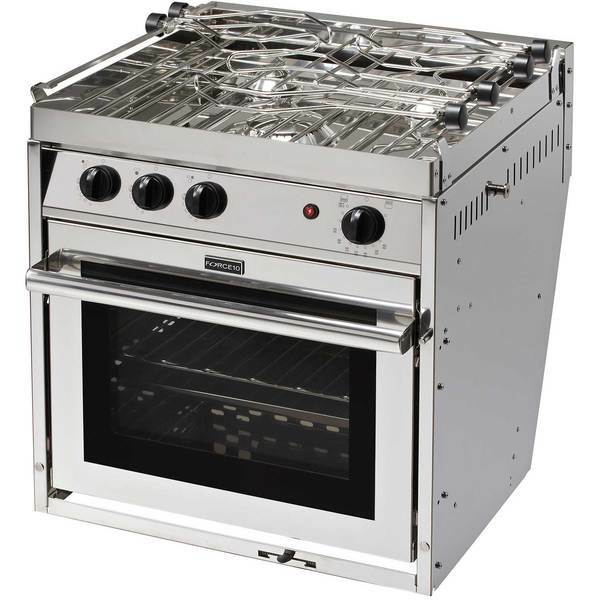 Force 10’s unique, patented slide-away oven door maximizes galley space while maintaining true gimbal balance-whether the door is open or closed. It locks securely in position when closed, but slides beneath the oven when open. All units include mounting hardware. The tilt-top grill raises for easy cleaning. Safety thermocouples at each burner stop the flow of propane seconds after the flame is extinguished. Each range is designed to accommodate a 3/8" female flare swivel. Includes two sets of pot holders. Trim kits for converting Models 1987338, 1988039, 1988096 and 1988146 to built-in installation sold separately. Three-burner models have one 8200Btu and two 4100Btu burners.